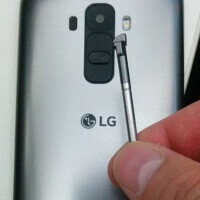 LG G4 Stylus shows up in leaked photo? The photos of an unannounced LG smartphone in a metallic plastic casing definitely sparked some intrigue and flagship-worthy hubbub. We're saying 'flagship', because the smartphone in question was widely assumed to be the upcoming LG G4, which is already LG's most interesting smartphone ever. Expectations run high, because the smartphone rides on the success of its predecessor, and is about to reveal LG's answer to Samsung's excellent new Galaxy S devices. Initially, we believed the phone was the LG G4 due to the design similarity with its predecessor - notably the plastic build and back panel-placed power and volume keys. There was also a curious cutout on the top left of the device, which we assumed was either a stylus, or (more believably) the slot for the TV antenna. The Korean version of the LG G3 has one, and the cutout for it looks much the same. However, the latest blips on the rumor radar paint a vastly different picture. The device in question might turn out to be a mid-range smartphone by the name of LG G4 s, powered by a quad-core Snapdragon 610 chipset with Adreno 405 graphics, and adorned with a smaller display of lesser resolution. And now, we have another misconception to clear up. The latest leak (courtesy of French leak patron NoWhereElse) shows that the cutout does, in fact, contain a stylus. This means the smartphone we're looking at may actually be the LG G4 Stylus (not to be confused with the LG G4s). It can also be the LG G4 Note phablet, which is set to debut in late 2015, but we strongly doubt this scenario. See, the LG G4 Note will be a flagship device (complete with rumors of metal build), while the smartphone in the photos has a rather unpretentious look, notably due to the enlarged bezels and sandpaper-like back panel texture. Additionally, the LG G3 Stylus and LG G3 s (which you may know as the LG G3 Beat or LG G3 Vigor), which LG released last year in different markets, have the same thing going an about them - they are based off the LG G3, but have enlarged bezels, poorer plastic build, and less hardware bite. They also cost a lot less. So, that was a sizeable bit of speculation to throw your way. As LG is set to introduce the LG G4 in late April, a week or two after the Samsung Galaxy S6 & S6 edge go on sale, there will be even more stuff to see, hear, and discuss around the upcoming flagship. looks too thin to be a stylus. Sure it's not a thermometer? It's not as advanced as the S-Pen. a midrange phone just like g3 stylus and g pro lite. Looks like a really, really long 3DS stylus. It's going to be good then. I just wonder why people like the styluses on phones. After captive touch came out, I didn't think it would be needed (the 3DS uses the other type of touch screen). Looks like an antenna attached to the bottom of the phone. Yeah, it is probably an antenna. Korean models often come with an antenna. The G3 for example. If you search for a photo of that version of the G3, you see that the antenna looks almost the same as the antenna ("stylus ") as on the G4 photo. So this is probably a TV-antenna. It's an antenna. They have TV's on their phones over in Korea.